This page describes the Applied Physics and Superconducting Technology Division contribution to LARP. More information can be found at the LARP website: http://www.uslarp.org/. First prototype QXF Hi-Lumi quadrupole magnet being dropped into the Vertical Magnet Test Facility in the Technical Division. Magnet is comprised of two coils wound and cured in the Technical Division and two coils fabricated by CERN. Cross section of a Hi-Lumi LHC Nb3Sn quadrupole. 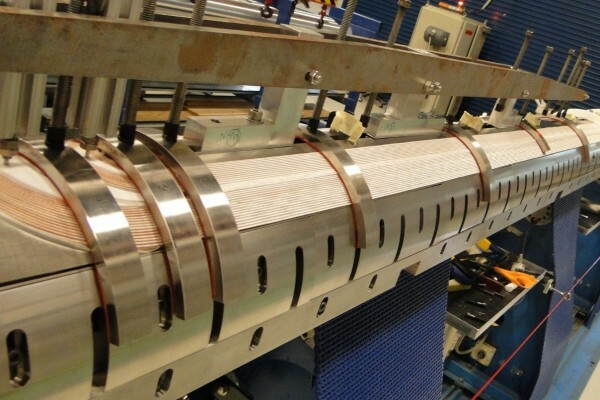 Coil was analyzed in the Technical Division for insulation and cable thicknesses and turn displacements. Winding Hi-Lumi LHC Interaction Region quadrupoles. 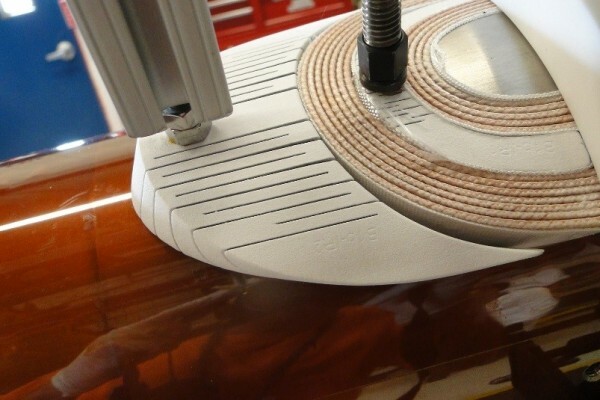 Coil winding takes place in the Industrial Building Complex of the Technical Division. Voltage taps and protection heater leads for Hi-Lumi quadrupoles. Voltage taps help detect quench during magnet testing. Protection heaters uniformly warm the coil so that the stored energy is not deposited in concentrated areas to prevent catastrophic coil destruction. 'Accordion' style end part pieces during the assembly of Hi-Lumi LHC Interaction Region quadrupoles. 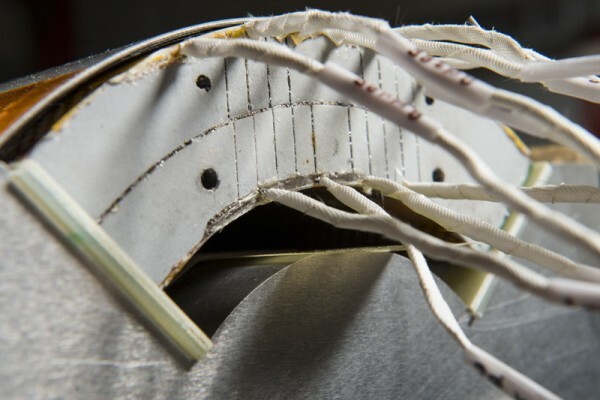 Slots allow each component to conform to the cable shape as shown by the intimate contact with superconducting cable of the inner end part between turns five and six. Preparing a long Hi-Lumi quadrupole coil for transport. Each coil is quality checked within the Technical Division for visual and electrical flaws and for precise size and shape verification. 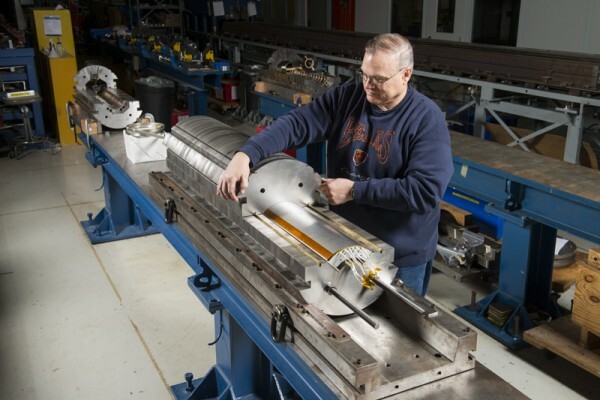 Assembling a Fermilab-built Hi-Lumi coil in a magnetic mirror configuration for testing. The mirror structure was developed by the Technical Division to enable quick feedback for design and fabrication. 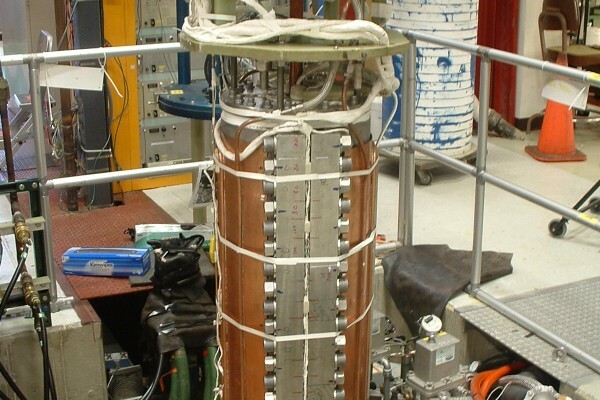 QXF Hi-Lumi quadrupole coil tested in mirror configuration at the Vertical Magnet Test Facility. The mirror structure was developed by the Technical Division to enable quick feedback for design and fabrication. The US LHC Accelerator Research Program or LARP was initiated in 2003 to develop and protect US investment in accelerator technology through the commissioning, operation, and upgrade of the LHC. For more than a decade the program has developed high-performance Nb3Sn quadrupoles for interaction region beam focusing. 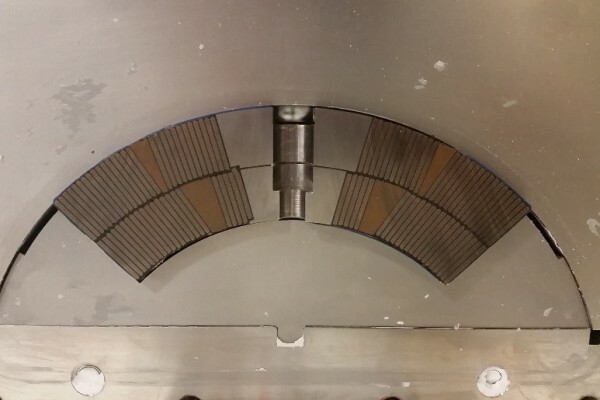 In addition, LARP continues to develop crab cavities for bunch rotating and luminosity leveling as well as wide-band feed back systems for beam instabilities. LARP R&D is predominately focused on the pending Hi-Lumi LHC upgrade where the integrated luminosity is to increase by a factor of 10. Currently LARP leadership is housed in the Applied Physics and Superconducting Technology Division. A key technology for Hi-Lumi LHC are large aperture Nb3Sn interaction region quadrupoles for final beam focusing. LARP has incrementally and successfully developed 90, 120, and 150 mm aperture quadrupoles using the brittle yet powerful material Nb3Sn. This development has taken place over the past 10 years with sufficient robustness to enable deployment in the LHC. 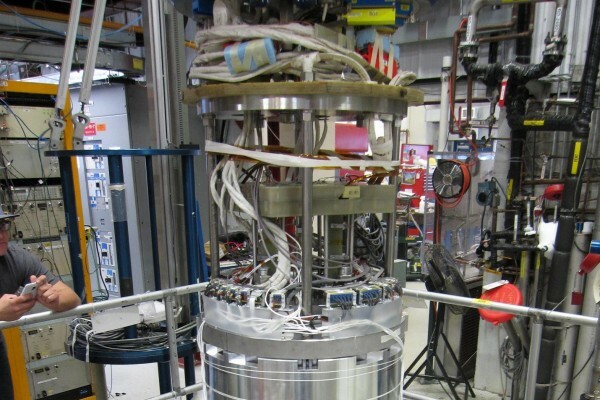 The Applied Physics and Superconducting Technology Division is heavily involved in the fabrication of the Hi-Lumi LHC Interaction quadrupoles from winding to testing. All prototype coils for the Hi-Lumi upgrade are wound and cured with a ceramic binder for handling in the Industrial Building Complex. The superconductor technology requires a 640°C Nb3Sn formation heat treatment and subsequent epoxy impregnation accomplished by the Applied Physics and Superconducting Technology Division. 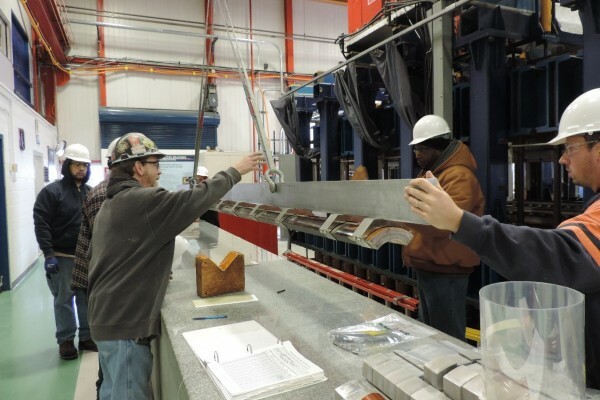 After four coils are assembled and preloaded into a magnetic flux return, the full magnet structure is cold tested within the Applied Physics and Superconducting Technology Division’s test facility. Beams of particles cross at slight angles when they collide which reduce the collision rate for typical particle colliders. To increase the number of collisions and thus the luminosity each beam bunch can be slightly rotated increasing the cross sectional area. In Hi-Lumi LHC this rotation will be achieved by superconducting RF Crab cavities. 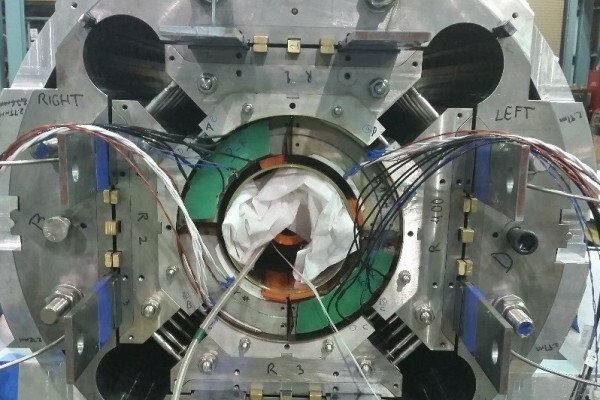 Crab cavities are under development in the Applied Physics and Superconducting Technology Division for ‘kicking’ the nose and tail of each bunch in opposite directions to maxim the luminosity increase for Hi-Lumi LHC.